Looking for an easy but healthy dinner? 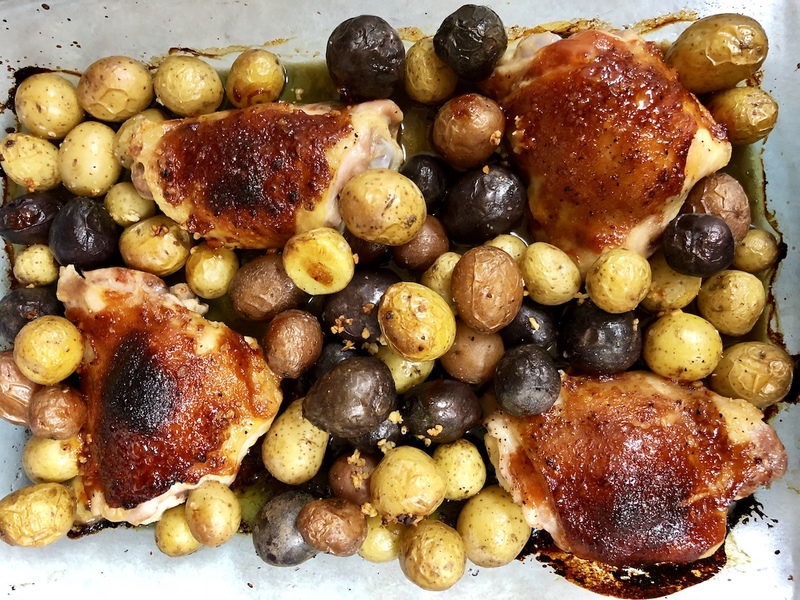 This one pan BBQ chicken thigh and potato dish is hearty, nutritious, Whole30 & Paleo friendly. Here's another one of those really easy dinner dishes. Similar to my one pan lemon chicken, but with an entirely different flavor, this recipe is perfect for the busy mom, the beginner cooks, or the college student on a budget. Feel free to use your favorite BBQ sauce in this recipe. I personally love Tessemae's as the ingredients are super clean and it's Whole30 approved. On the label of the Tessemae BBQ sauce for those interested: Organic Date Puree (Organic Dates, Water, Organic Lemon Juice), Organic Tomato Paste (Organic Tomatoes, Salt), Organic Balsamic Vinegar, Water, Organic Mustard (Organic Vinegar, Water, Organic Mustard Seed, Sea Salt, Organic Turmeric, Organic Spices), Sea Salt, Organic Black Pepper, Organic Coconut Aminos, Organic Spices, Organic Onion Powder, Organic Garlic Powder. Enjoy this BBQ chicken and potato bake guilt-free & stress-free. 2) On a high heat, fill a large saucepan with water. Bring to boil. 3) Add potatoes and reduce to a medium temperature. Cook until they are slightly soft but not done all the way through. 4) In a large bowl, mix the chicken thighs with BBQ sauce until fully covered. 5) Add lightly cooked potatoes to a baking dish. Top with chicken thighs. 6) Bake for 60 minutes, or until chicken is cooked through.